The philosophy of the JP Modular Hand Guard System has always been "rail where you want them, not where you don't," because our years of experience have shown that a typical shooter only needs one or two sections of rail, strategically positioned, to meet his or her needs. Still, despite the lighter weight (20% lighter than standard tubes) and ergonomic comfort of our design, many of our competitors�if they haven't followed our lead�continue putting out heavy, bulky quad-rail systems that don't even allow for accessories installed at the 45° positions. Our signature hand guard design is the coolest running tube on the market and features our unique dual-nut design proven to offer high rigidity while maintaining cosmetic appeal. With tubes available in standard rifle, extra long, mid- and carbine lengths, this system is primed to meet any need, and thanks to our unique eccentric nut design, even .308 rifles can utilize the same convenient 2" diameter tubes as a .223. Safety: With some hand guards, depending on the optic/sight setup, it is possible to grab the rifle in such a way as to touch the hot gas tube. The JP outer nut design and tube completely shield this area to prevent this from happening. The nut also completely covers the transitional area between the receiver and nut to prevent the exposed tube from being crushed if the rifle is dropped on a rock in just the right manner. The chances of this are remote, but on the battlefield or in any tactical operation, anything can happen. There is also a significant reduction of the thermal optical distortion effect from hot air off the barrel/gas tube rising in front of the scope or sights under calm conditions. Precision: Free floating tubular hand guards for the AR-15 offer the greatest improvement in accuracy of any single modification. In addition to overall accuracy improvement, point of impact will not change regardless of how the rifle is being shot, whether with a bipod, sling or hand held. Assuming a good barrel and ammunition, it's not uncommon for accuracy to improve from 1.5-2.0 MOA to sub-MOA with a properly installed free float tube. Our tube is secured to the outer nut with six flathead screws for a rock solid relationship that will never turn and will remain precisely aligned to the upper receiver. Therefore, any accessories like secondary sights, co-witnessed sights or tactical lights will stay in precise relationship to the upper receiver improving accuracy and hit probability with those accessories. The ventilated, fluted design is also 20% lighter than standard tubes making this the coolest running tube in terms of heat dissipation. 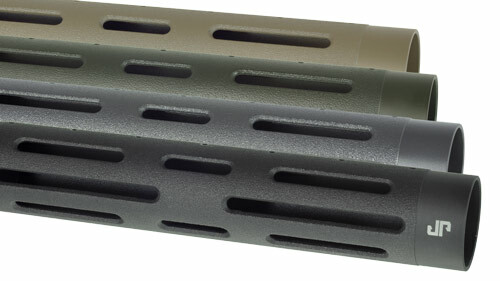 Additionally, for large-frame rifles in particular, the advantage of the JP Modular Hand Guard comes in its use of the more comfortable and ergonomic 2" tube on the larger rifle instead of the 2.25" tube typically required due to the spacing on the barrel and gas system of the large rifle. Our unique eccentric barrel nut assembly situates the barrel slightly lower in the hand guard to allow the 2" tube to clear the gas system. One quarter of an inch doesn't sound like much, but it makes a huge difference in the feel and handling characteristics of the rifle. Now your .308 rifle will feel like your AR-15. Versatility: Many popular hand guard systems on the market today have permanent rails at the 6:00, 12:00, 3:00 and 9:00 positions. Yet, on a typical rifle, you really only need one or two sections of rail, and in many cases, they are best utilized at the 1:30 or 10:30 clock positions, not 9:00 and 3:00. Having to deal with the additional weight and uncomfortable feel of all these rails where you don't need or want them is not acceptable. These are just another example of products designed by people who are not real shooters for customers who just want their gear to look cool but don't actually use it. The JP Modular Hand Guard System, on the other hand, allows for complete flexibility without wasted weight and features you don't need. 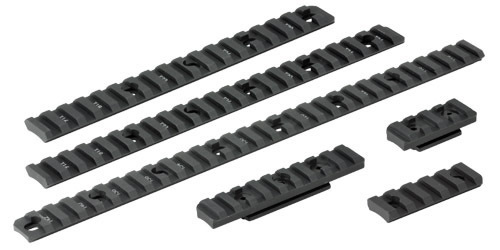 Our hand guard tubes come in rifle-length, extra long, carbine, and mid-length tubes, and each will accommodate optional 12:00 rail units that extend the upper receiver rail interface onto the hand guard, allowing for the use of co-witnessed IR equipment, secondary sights or flip-up iron. Additionally, individual four-inch and two-inch rail segments are available for personalized accessory configuration. All accessories can be quickly relocated at will, and you can use as many rail units of whatever length makes sense when and where you need them. Just forget about those cumbersome rails you don't need. Various tactical rail lengths and styles offered for our JP Modular Hand Guards. There's also no need to drill unsightly holes for studs that may not align after disassembly/reassembly. The floating studs included allow complete flexibility for a tactical sling setup as well as bipod positioning, whether all the way out for maximum stability or all the way in next to the receiver for the fastest possible target indexing. Taken all together, the options built into the JP Modular Hand Guard System allow for a tube/rail/accessory configuration ideally suited for virtually any application. Integrity: This design features a dual-nut system with a 6061 T6 outer receiver extension nut combined with a carbon steel internal barrel retainer nut that can be secured with a standard M16 armorers wrench rather than the strap wrench needed on one-piece tubes. 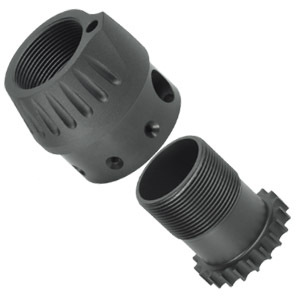 This improves the overall structural integrity of the barrel/receiver relationship and makes it possible to achieve a precise 12:00 index of the tube regardless of where the internal nut needs to be for proper torque. What Our Customers Think "What an impressive weapons system"
"This will be my primary rifle for USPSA competitions in Limited and Open division"